EUR/JPY trades 0.19% lower on the day at 124 handle at 1045 GMT, bias bearish. The pair is in a downtrend and has breached major trendline support and 200-W SMA on the weekly charts. The common currency little changed after Euro-zone CPI matches flash estimates. Euro on the defensive and continues to be weighed down by concerns over a slowdown in the Euro-zone. Volatility is on the rise and we see scope for test of 61.8% fib at 120.01 level. 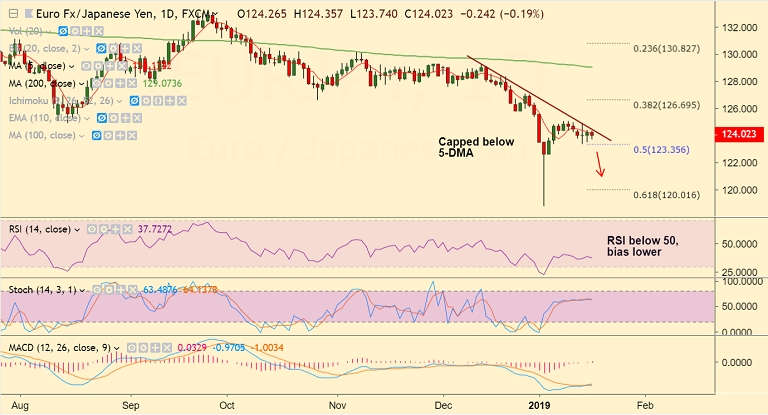 Upside finds stiff resistance at major trendline at 124.35. Breach above could see minor upside.